Need a way to better target your ideal audience? Want to know more information about the age, gender, and interests of your website visitors? To know more about your current visitors, and to better target your ideal audience, you’ll need to collect the demographics and interests data for your website visitors. 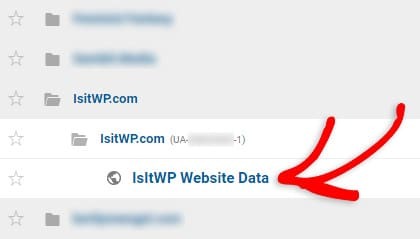 In this article, we’ll share how to collect WordPress visitor demographics with Google Analytics. Why Collect Demographics and Interests Data? Collecting demographics and interests data lets you know more details about your visitors so you can deliver content, or create products, addressing their needs. Drilling into the demographics and interests report lets you identify who your high-value customers are. Once you’ve identified your high-value user group, you can target that group for marketing and remarketing campaigns for more conversions and ROI (return on investment). If you own an eCommerce shop, collecting a demographics and interests report helps you to identify user groups with the highest eCommerce conversion rates or revenue. For example, you can identify the age group, gender, and interests of your high-value users. Then, you can run a Facebook ad campaign and target that specific group to boost conversions and ROI. It also helps you to identify your buyer personas, so you can mold your product to those groups and adjust the copy of your site to address their unique needs and concerns. If you’re a publisher, you can determine the user groups with the highest engagement. That way, you’ll get to know which content interests that group the most. It also gives you hints for future content ideas so you can deliver more content for that specific group, which will likely drive more revenue and engagement. To start collecting the demographics and interests data, you’ll need to make sure that you’ve enabled tracking capabilities for that data on your website. We’ll walk you through how to enable the WordPress visitor demographic report, step-by-step. The very first step is to install MonsterInsights on your site. MonsterInsights is the best Google Analytics plugin for WordPress. It helps you quickly and easily set up Google Analytics on your site. You won’t have to touch a single line of code for the basic setup or to collect any additional tracking data, like demographics data. For a step-by-step guide, read how to properly connect Google Analytics with MonsterInsights. Navigate to Insights » Settings on your WordPress dashboard. Then, click on the Engagement tab at the top of the page. Now you’ll see the Demographics section at the top of your Engagement settings. Check the Enable Demographics and Interests Reports for Remarketing and Advertising option. Now, log into your Google Analytics account. Then, click on the site you would like to enable Demographics and Interests for. This will direct you to the Reporting tab for your account. Next, click on Audience » Demographics » Overview from the menu on the left side of the page. From there, click the blue Enable button. That’s it! It may take a day or so before Google Analytics can give you all your demographics and interests data. Once you’ve set up the tracking, you can find an overview of the demographics data in your dashboard reports by MonsterInsights, right in your WordPress dashboard. Navigate to Insights » Reports and click on the Publishers tab. Now, you’ll see your demographics data displayed in beautiful graphs. As shown in the screenshot above, you’ll see the exact breakdown of your users by age and gender. You can also view the Interests report in your MonsterInsights Publishers report. Moreover, the Publishers report includes other important reports like top landing pages, affiliate tracking, download tracking, etc. 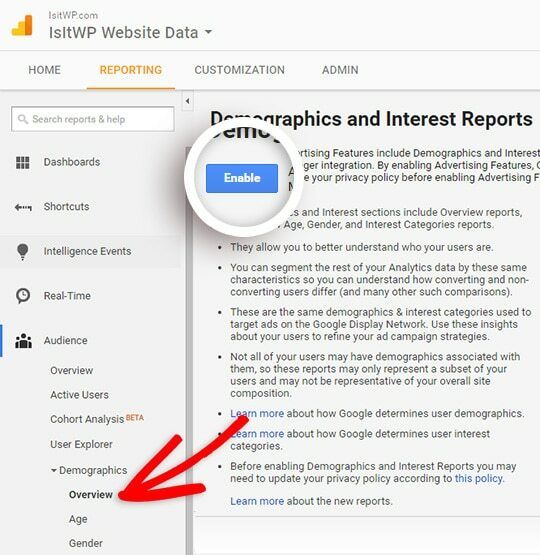 You can view your Demographics data in your Google Analytics account as well by signing into their website. 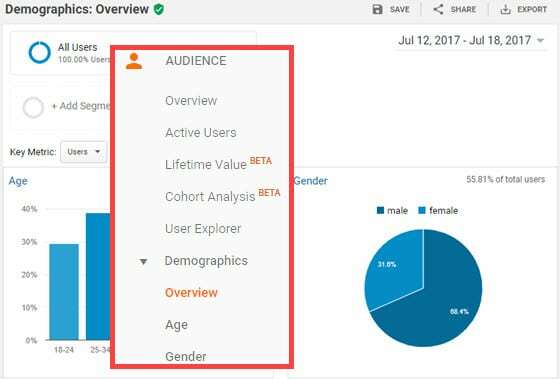 Open Google Analytics’ website on your browser, log into your account, and navigate to Audience » Demographics » Overview. To get a detailed demographics report, you may click the Age or Gender menu below the Demographics tab in the left taskbar. 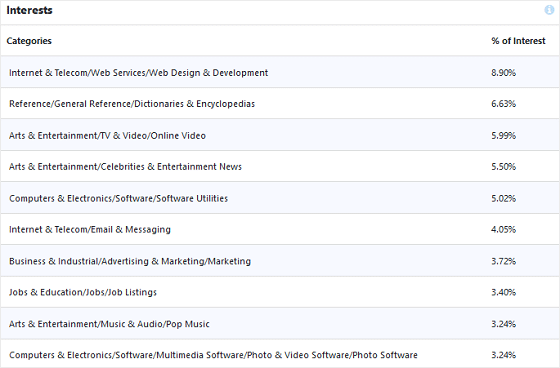 To see an overview of the interests data, you can visit Audience » Interests » Overview. 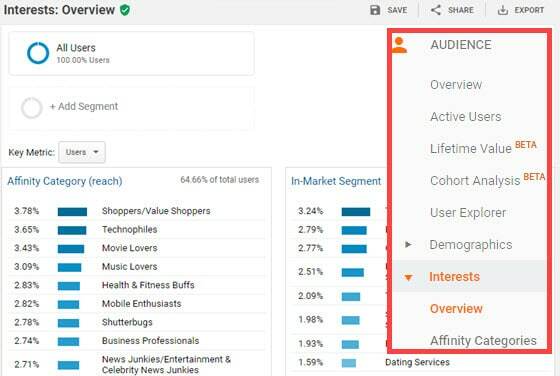 You can also find a detailed interests report on affinity categories, in-marketing segments, and other categories in Google Analytics. We hope this article helped you set up your demographics and interests report in Google Analytics. Collecting demographics data will help you run profitable remarketing campaigns. If you’re also running offline marketing campaigns to promote your business, you can track them in Google Analytics for better ROI.